Thank you for your interest in the J. Mike Walker '66 Department of Mechanical Engineering at Texas A&M University. 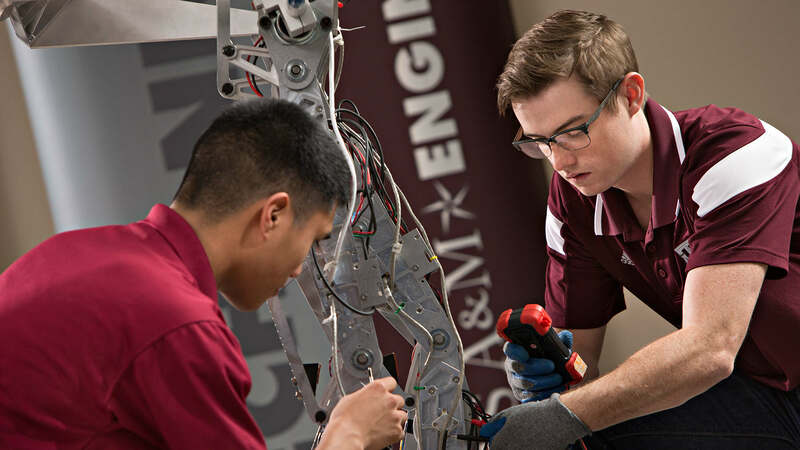 Mechanical Engineering is one of 14 departments in the Texas A&M University College of Engineering (the biggest college on the Texas A&M campus). Among public institutions in the nation, our undergraduate program is ranked 7th and our graduate program is ranked 8th. Through the curriculum, our department strives to prepare our undergraduate and graduate students for careers in traditional Mechanical Engineering fields as well as careers in cross-disciplined areas in research, academia and industry. We also pride ourselves on our research. Our faculty’s research expertise includes; Thermal and Fluid Sciences, Materials and Manufacturing, Mechanics and Systems and Controls. The best way to learn more about Mechanical Engineering at Texas A&M is to schedule a visit. Providing quality education that is well-grounded in the fundamental principles of engineering, fostering innovation, and preparing students for leadership positions and successful careers in industry, government and academia. Advancing the knowledge base of mechanical engineering to support the competitiveness of existing industry and to spawn new economic development in Texas and the nation through active involvement in basic and applied research in a global context. Providing professional development opportunities for practicing engineers through continuing education, service, and outreach activities. Develop more collaborative research programs outside the U.S.
We need to recruit strong faculty to improve our student to faculty ratio. With the drop in tenured/tenure-track faculty over the past decade, the student to tenured/tenure track ratio in the department has increased from 22 to 29. We are looking forward to increasing our faculty by 12 during that same time. This will reduce our student to faculty ratio and allow us to expand research into new and exciting areas such as mechanobiology and nano-materials. The department will need resources to provide competitive salaries to retain our top faculty. The department also needs to establish endowed fellowships for junior faculty, which can be used to support, retain, and reward high performing young faculty. The J. Mike Walker '66 Department of Mechanical Engineering currently has three recognized research programs, the Turbomachinery Laboratory, the Polymer Technology Center, and the Energy Systems Laboratory. The faculty have identified several new signature areas through which the department can achieve international recognition and funding from federal agencies. These new programs include mechanobiology, micro-turbomachinery, advanced nano-materials, and heat transfer. Department visibility will increase as more faculty members are involved with professional societies, and our goal is to see that every senior faculty member is a Fellow of their respective societies. Improving the quality of our students will require raising the standards for incoming students. The department seeks to attract both high quality domestic and international students. To attract superior domestic students, the graduate stipends must increase in order to be comparable to those offered by our peer institutions. Our department also lags behind our peer institutions in the number and availability of graduate fellowships. At present, our department has only two graduate fellowships. Our goal is to have at least ten such fellowships in the coming decade. Approximately one-third of our graduate students are in the doctoral program. Currently there are 6.8 research students per faculty. We will seek to improve the quality and reduce the number of graduate students to five per faculty. Currently 70 percent of our graduate students are international, and less than 11 percent are minorities and women. Our five year goal is to have a majority of our students be domestic and have at least 25 percent of our students be minorities. We want to provide more scholarships to attract highly qualified undergraduates. Our long-term goal is to raise a $5 million endowment for undergraduate scholarships, which will provide $250,000 per year for scholarships. The faculty feel that both cooperative, internship, and study abroad experiences enrich the undergraduate program in mechanical engineering. Our goal is to increase the fraction of students participating in co-op and intern programs from 8 percent to 25 percent in six years and in study abroad experiences to 10 percent in ten years. Currently, students have design projects their senior year that are sponsored by industry or government laboratories. Our two-year goal is to incorporate more open-ended design in junior engineering science courses. Our students need project design experiences built on a foundation of engineering science. A two-year goal is to incorporate open-ended design in the junior engineering science courses. Laboratories provide our students with ‘hands-on’ experience of instrumentation, materials, fluids, and heat transfer. As new fields develop within mechanical engineering, we need to provide more funding to equip laboratories to support courses dedicated to these new fields.